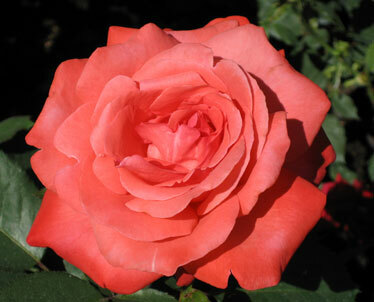 Butchart Gardens' popular Rose Garden flourishes during July and August. There are few places that look as perfect as they do on a postcard. Victoria's Inner Harbor, however, is one of them. Located on Vancouver Island, the Canadian town's regal harbor is flanked by the Fairmont Empress, the British Columbia Legislative Buildings and the Royal London Wax Museum. The surrounding downtown area, where many major sights are located, is easily traversed by foot. A blend of British, First Nation and Canadian cultures prevails; here a double-decker bus can pass by a totem pole and a maple leaf flag within the same minute. 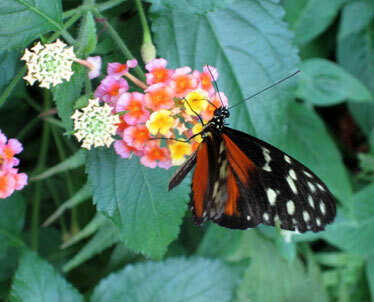 Hundreds of brightly colored butterflies in various life stages greet visitors at Victoria Butterfly Gardens. It is no wonder that Victoria is almost synonymous with Butchart Gardens. When Jennie Butchart decided to transform a limestone quarry into what is now the Sunken Garden, she probably had no idea that eventually, more than 1 million visitors a year would flock to this National Historic Site. Costs are approximate and subject to change. Fly from Hawaii to Victoria on Air Canada, Alaska, Continental, Hawaiian or Northwest airlines. A round-trip economy ticket costs $600. Alternatively, fly to Washington state or British Columbia and travel by sea to Victoria. Boat service is offered by British Columbia Ferry Services, Victoria San Juan Cruises, Victoria Express, Prince of Whales, Black Ball Transport, Victoria Clipper and Washington State Ferry. » Chandlers Seafood House: Located on the wharf, the restaurant offers locally caught king salmon and battered fish and chips. At 1250 Wharf St. Call (250) 385-3474. » Il Terrazzo Ristorante: Portions are large and hearty at this popular Italian restaurant, voted Victoria's "Best Italian Restaurant" 10 consecutive years. At 555 Johnson St. Call (250) 361-0028. » Periklis Greek Restaurant: Casual, family dining with friendly wait staff plus belly dancers. At 531 Yates St. Call (250) 386-3313. » Best Western Carlton Plaza: Clean and modern, located within walking distance of the Inner Harbor. Room rates start from $150. At 642 Johnson St. Call (800) 804-6835. 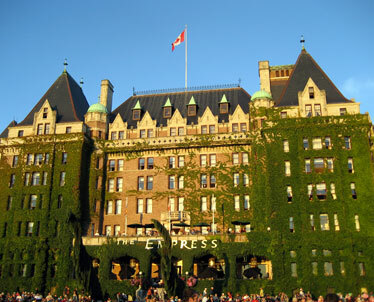 » Fairmont Empress: Victoria's classic upscale lodging choice fronts the Inner Harbor. Room rates start from $330. At 721 Government St. Call (800) 804-6835. Although the gardens are open year-round, the most colorful blooms occur during July and August. The sheer magnitude of flowers is almost overwhelming; no wonder 50 gardeners are employed here. The helpful Flower & Plant Guide, free with admission, assists us in identifying the oddly petaled whirligig daisy, upside-down angels' trumpets and Himalayan blue poppies. I learn the difference between a weeping sequoia and willow, and how to tell a bearded from a painted tongue. Past the oft-photographed Sunken Garden is the ever-morphing Ross Fountain. Next are the bog garden and a viewing area for summer fireworks. The Rose Garden, with its romantic arches, is the most crowded spot in the park. Beyond are the Japanese and Italian gardens, Butchart Cove, and the eight-sided Star Pond. Often overlooked due to its location near the parking lot is the Mediterranean Garden. After wandering, guests can quench their thirst by partaking of afternoon tea in the Dining Room Restaurant or indulging in an ice cream cone at Gelateria Benvenuto. The Seed and Gift Store is surprisingly large at 8,600 square feet. It is well stocked not only with floral items such as hand-packaged seed, but also a myriad of Canadian souvenirs. Nearby is the Victoria Butterfly Gardens. Large chrysalises and spiky caterpillars are on display. Hundreds of butterflies ranging in color from tangerine to emerald green flutter overhead. A few alight atop flowers held out by eager guests as we await the complimentary tour. A brightly patterned Atlas moth sits so still that I wonder if it is alive. The guide arrives, informing me that the insect is sleeping. The gardens are also home to exotic birds and plants. The South African turaco and flamingos can be spotted, and a display of carnivorous plants intrigues old and young alike. Upon exiting, we are asked to make sure that no butterflies try to make an escape run by hitching a ride on us. On the way back to Victoria, we take the Marine Scenic Drive. Most of the views along the earlier part of the route are obstructed by housing, but the last few miles yield expansive bay panoramas, with the ocean and still-snowy mountains in the distance. Victoria's Symphony Splash occurs the weekend my family and in-laws arrive. At this annual concert, the Victoria Symphony serenades more than 40,000 attendees from a barge in the harbor. In the background, the Legislative Buildings glow with more than 3,000 lights. Most tourists listen from the lawn of the latter, but a number of kayakers and canoeists paddle in for front-row seating. The Inner Harbor is the setting for a variety of events, including a Harbor Ferry Ballet which takes place Sunday mornings in the summer. This charming area is also home to several places worth visiting. First is the Royal British Columbia Museum, which houses more than 7 million objects. On the ground floor, a map of British Columbia is projected in 3-D, showing just how large the Canadian province is at 364,762 square miles (in contrast, the state of Hawaii, including water, is 10,932 square miles). Natural history is the theme of the second floor, with galleries containing computerized real-time weather patterns, a hands-on ocean station and a life-size woolly mammoth. Around the corner, the temporary exhibit "Titanic: The Artifact Exhibition" is the literally chilling; its displays include a man-made iceberg you can touch. The third floor houses an impressive First Peoples Gallery, which includes imposing totem poles, traditional masks, fine Haida argillite carvings, a Kekuli (Pit House), and a Kwakwaka'wakw Big House. 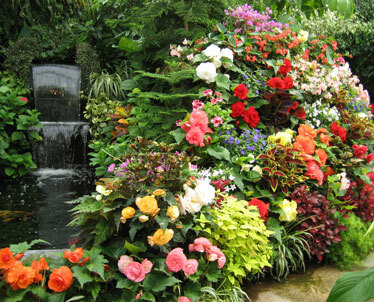 Butchart Gardens encompasses 55 acres and has been in bloom for more than 100 years. The dignified Fairmont Empress has 477 rooms and will celebrate its 100th birthday in 2008. Over in the Modern History Gallery, two-story displays of commercial and residential buildings replicate life in the 1800s. A Cornish waterwheel churns while a docent pans for gold. Cannery and mining exhibits are followed by a walk through the HMS Discovery. Next, 20th Century Hall brings visitors almost to the present day. Directly behind the museum is Helmcken House, which never moved from its original site. The residence was built in 1852 by a local doctor. A few steps away is Thunderbird Park, with its Big House and famous collection of totem poles. The Fairmont Empress across the street beckons tourists to high tea. Within the famous hotel is the somewhat dated Miniature World. More than 80 intricately designed dioramas are on site, ranging from Olde London Towne to the Great Canadian Railway, from Circus World to Space 2201. An English influence is evident in scenes from Charles Dickens, Shakespeare and Old World fairy tales. Miniature World also features two of the world's biggest doll houses. 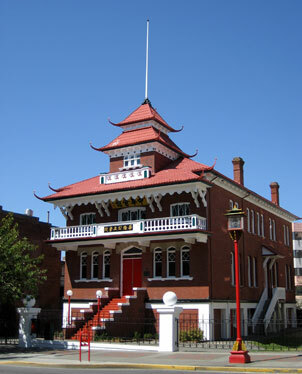 A school fronts Canada's oldest Chinatown. The compact but well-established ethnic neighborhood was founded in 1858. 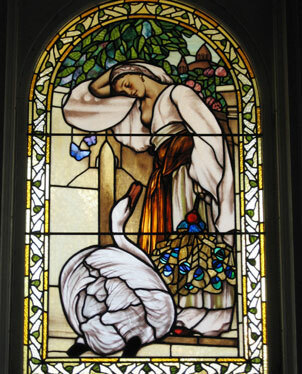 A reproduction of an original stained glass window in the drawing room of Craigdarroch Castle. Entering downtown, we pass Beacon Hill Park, an ideal spot for strolling or for children to play. A short drive away is Craigdarroch Castle, commissioned in 1887 by coal baron Robert Dunsmuir. The wealthiest person in Victoria at the time, his estate was estimated at $15 million to $20 million at his death in 1889. Sadly, Dunsmuir died before the castle was completed in 1890. The mansion was then occupied by his wife, Joan, three single daughters and two orphaned grandchildren. The building later served as a military hospital, a college, an office and a conservatory, and is now a museum. Craigdarroch Castle's rooms -- including an organ alcove, billiard room and breakfast nook -- have been restored with period furnishings, making it easy to imagine the life of the Victorian upper echelon. The Steinway piano in the dance hall is not original to the house, but dates to 1879 and can be played by visitors. Next is the view of Victoria's skyline from the tower, which, after ascending 87 steps is a welcome reward. All of this touring can make a person hungry, so next on the list is dinner. Old Town is filled with restaurants ranging from Indian to Greek. Il Terrazzo, with its generous portions of savory Italian food, is packed. Interspersed between the restaurants in Old Town are a myriad of consumer temptations ranging from Canada's famous department store, the Bay, to a year-round Christmas shop. Tartan and tea sets reflect Victoria's distinctively British heritage. For inexpensive fare, Chinatown is a good choice. Sights to see along the way include the Gates of Harmonious Interest and Fan Tan Alley, once known for its gambling and opium dens. Since it is located on an island, Victoria is serviced by a number of ferries and cruise ships. We take the Washington State Ferry back to Anacortes, Wash. The ferry offers a smooth, comfortable ride that takes us past the scenic San Juan Islands. Scanning the horizon, we hope to catch a glimpse of resident orcas, but all we spot are pleasure boats, especially around popular Friday Harbor. After a long wait, it is our turn to approach U.S. Customs at the border stop in Anacortes. "Did you bring anything back from Canada with you?" the agent queries. "Just one souvenir," my husband replies. "That's all?" the officer asks, somewhat incredulously. Materially, yes. Intangibly, however, I have also brought back something else; I have returned with many wonderful memories. Rather than amass souvenirs of the places I have been, I prefer to collect unique experiences that stretch and shape me, such as being surrounded by tens of thousands of people in the Inner Harbor, celebrating riotous floral beauty in Butchart Gardens or being awed by the Kwakwaka'wakw totem poles. I do not explain this to the agent because it would appear to be, as my Canadian friends would say, snarky. So I keep my thoughts quiet, and the officer waves us on into the U.S. mainland, a mere three-hour ferry ride but seemingly worlds away from Victoria. Monica Quock Chan is a Honolulu-based freelance writer and former marketing executive. She has lived in Europe and Asia, and traveled to more than 50 countries.